A piece by RMS warning about how we are using more and more web apps and that we should care whether these apps are free software as much as we care whether our "traditional" software are free software. A question on Stack Overflow (No 1239470) regarding the consequences of using a GPL'd library on one's website. Unfortunately this question was closed as off topic and all the answers which were given at that time are pretty bad. In particular, the first answer is horrible but it still has 13 upvotes (after my own downvote). This is pretty sad given that the question was viewed 12645 times. I am not linking to the question to avoid giving it more pagerank that it already has. A similar question on Programmers SE with a more reasonable answer. A short blog piece https://hroy.eu/posts/gpl-js-bs/ which explains clearly that using a single GPL'd component on a website does not require open sourcing the whole website. But if you build your web app on top of some GPL'd component then the whole web app should be GPL'd as well. A very good FAQ http://greendrake.info/content/nfy0, which is quite recent (Sep 2015) and which I recommend, anwsering most questions that people may have on using GPL'd client-side code. If I use a GPL'd component on my website, is the content of the website affected? If I use a GPL'd component on my website, is the design (CSS) of the website affected? If I use a GPL'd component on my website, are other JS components affected (if each of the component is loaded in a different <script> tag)? If I use a GPL'd component on my website, are other JS components affected (if all the components are loaded from the same main JS file)? If I build a web app and it uses a GPL'd component/library, does it mean that the full web app should be released under GPL (at least the client-side part of it)? Is the design (CSS) of the web app also affected then? I am aware that not all of these sub-questions have necessarily a well-defined answer. Feel free to answer even only partially to the ones you feel comfortable answering. As a special exception to the GPL, any HTML file which merely makes function calls to this code, and for that purpose includes it by reference shall be deemed a separate work for copyright law purposes. In addition, the copyright holders of this code give you permission to combine this code with free software libraries that are released under the GNU LGPL. You may copy and distribute such a system following the terms of the GNU GPL for this code and the LGPL for the libraries. If you modify this code, you may extend this exception to your version of the code, but you are not obligated to do so. If you do not wish to do so, delete this exception statement from your version. Thus, if I read this right, in case of presence of such a note it's a definitive no to points 1, 2 & 6. With 4 you'd probably have to release JS under LGPL. Absense of this note most likely means the opposite. According to this, JS libraries in most cases may be cosidered separate programs, not binding each other. Linking a GPL covered work statically or dynamically with other modules is making a combined work based on the GPL covered work. This is contrary and would mean requirement to release under GPL-compatible license (in case of modules not necessary GPL itself). It depends on how the program invokes its plug-ins. This definition (barring the quotes) is the same both for GPL 2 & GPL 3, making GNU's stance the same as Mozilla's - minified/obfuscated JS (which is common for libraries) is not source code, thus you must follow only distribution requirements (in most cases - providing a link to a library's page you used yourself). Note, that I'm not a GPL specialist and just quoted some of the FAQ. Someone with a better knowledge of the license may provide a better answer. The following is the answer I got from FSF, with small edits. Answer was provided by a volunteer with "[this] is not legal advice" disclaimer. GPL-ed JS is used with other JS without cross calls. 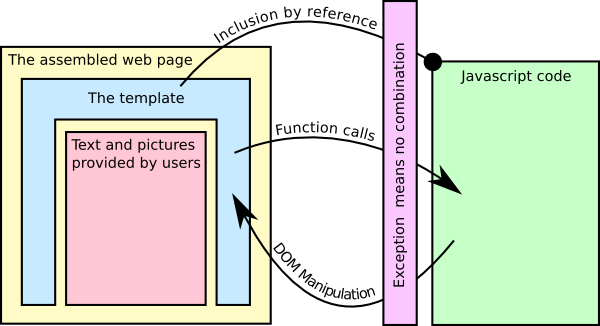 GPL-ed JS extends the DOM/core functionality; extended functionality is used, but no direct calls are made. GPL-ed JS is called by other JS, from within HTML file or separate script; does the origin of calling JS makes difference? GPL-ed JS is used in web page without any calls; is HTML/CSS bound by GPL? Does FSF's point of view coincides with Mozilla's in that minified/obfuscated JS is not source code? The FSF's view is codified in the terms of the GNU GPL. The GPL defines source code as the preferred form for making modifications to the work. This obviously excludes all forms of obfuscated or unreadable code. What are the details of this accusation regarding the “web app loophole”?